Enterprise Content Management (ECM) is the most sought-after system to effectively obtain, organize, store and deliver business-critical information and made accessible to the right people at the right time. ECM is expert to manage any form of organization’s documents like Word documents, Excel spreadsheets, PDFs and scanned images etc. 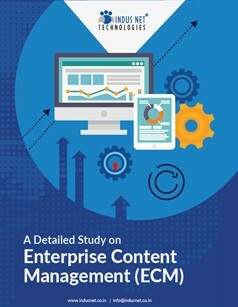 When, by 2020, 20% of all business content will be authored by machines, ECM helps businesses to remove the dependency on paper and streamline lifecycle of information, deliver better customer service, swell up productivity and reduce organizational risk. In this eBook, we have categorically compared three leading ECM software available in the market. Read the full article.